This concise edition of the award-winning field guide is both portable and compact, making the book accessible and key species easier to locate. Up-to-date text covers the identification, voice, habitat, behaviour and range of all the species and distinctive subspecies of the region. It forms a complete field and reference guide to the birds of Thailand, Peninsular Malaysia, Singapore, Myanmar (Burma), Laos, Vietnam and Cambodia and also covers a wide range of species found in the Indian subcontinent, China, Taiwan, Sumatra, Java, Bali, Borneo and the Phillippines. With 142 colour plates, author Craig Robson details the plumage variations of 1270 bird species found in the region. Paperback - 304 pages, 140 full colour artwork plates. 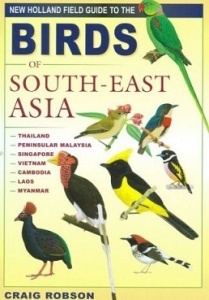 Craig Robson has travelled regularly to South-east Asia for the last 20 years, having seen and studied more bird species of that region than anyone else in Europe. He helped launch the thriving Oriental Bird Club and served on the Council of the OBC for 5 years, writing numerous papers in their journal during that time. Craig is based in Norfolk, England. A selection of leading artists, all of them specialists in their fields, have been specially commissioned to provide the full-colour identification plates. The artists include Richard Allen, Hilary Burn, Clive Byers, Daniel Cole, John Cox, Antony Disley, Martin Elliott, Mike Langman, Ian Lewington, Andrew Mackay, Stephen Message, Chris Schmidt, Jan Wilczur and Tim Worfolk.